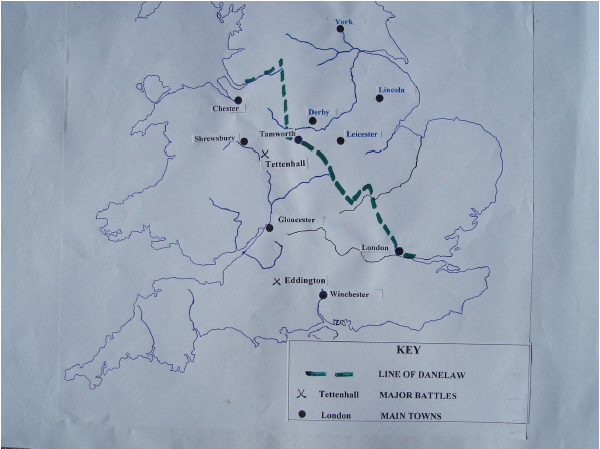 In 917, two years after the founding of the fort at Runcorn, Mercian troops led by Ethelfleda played a decisive part in the general offensive of King Edward against the Danes. She took Derby and Leicester from the Danes. She had received an agreement from the citizens of York to take the city and was on her way to York when she died in 918 in Tamworth aged 49. She was buried in St Oswald's priory in Gloucester alongside the bones of St Oswald a former Christian king of Northumbria. She and her husband Ethelred had reconstructed Gloucester from Roman ruins and laid out the core street plan, which is still in existence today. There were rumours that her brother was jealous of her success and had a hand in her death. This seems unlikely as when Edward travelled to Tamworth, on hearing of her death, the Mercian Army and their allies turned to him. However the conquest of York was delayed until his son Athelstan became king.